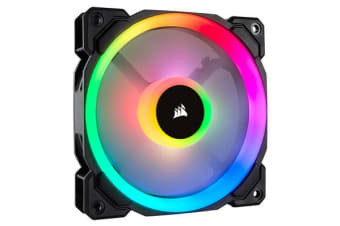 The CORSAIR Light Loop LL140 RGB PWM fan combines excellent airflow, low-noise operation and 16 brilliant independent RGB LEDs, spread between two separate light loops that encircle the fan and its hub. Pair with an existing LL140 RGB kit or CORSAIR Lighting Node PRO (sold separately) to customize lighting with a wide array of vivid effects and patterns. Using an optimized 120mm fan blade and PWMcontrol, set the speed of the fan anywhere from 600 RPM to 1,300 RPM for precise noise and airflow adjustment. Made for those seekingexcellent airflow, quiet operation, and powerful lighting, the CORSAIR LL140 RGB fan puts your PC back in the loop.